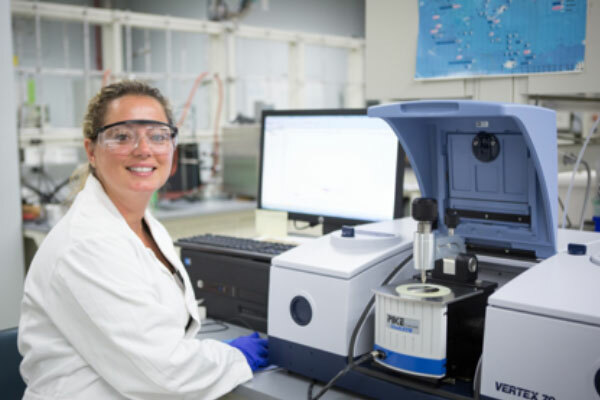 Doctoral student Esin Schulz spent her summer at the National Energy Technology Laboratory (NETL) developing a chemical sorbent to selectively remove oxygen from the air. With a passion for solving interesting and challenging problems, Ph.D. student Esin Schulz chose a STEM path in materials science and engineering. As a participant in the U.S. Department of Energy’s (DOE) Mickey Leland Energy Fellowship (MLEF) Program, she was able to do just that. Under the guidance of Evan Granite and Elliot Roth, in the Functional Materials Development Division at the National Energy Technology Laboratory (NETL) in Pittsburgh, Pennsylvania, Schulz was tasked with developing a new re-generable chemical sorbent to selectively remove oxygen from the air. Oxygen has numerous applications, including oxy-combustion and gasification of coal (which are of direct interest to the DOE), as well as high demand in many areas of industry, such as production of steel and glass, chemical processing, welding and medicine. While methods to remove oxygen from air already exist, they are expensive. Nonstoichiometric oxides show promise because they have a high selectivity for oxygen over nitrogen and high oxygen adsorption rates. Schulz synthesized a metal oxide using a solid state reaction method and characterized the oxide by its storage and release abilities. Next, she used doping techniques to increase the oxygen uptake and release properties and oxygen capacity. In order to compare her results, she completed similar processes with other materials. The MLEF Program is administered by the Oak Ridge Institute for Science and Education (ORISE) for the U.S. Department of Energy.